Friday 28 October Great Western Society North West Branch. Railway Personnel. Paul Shackcloth. 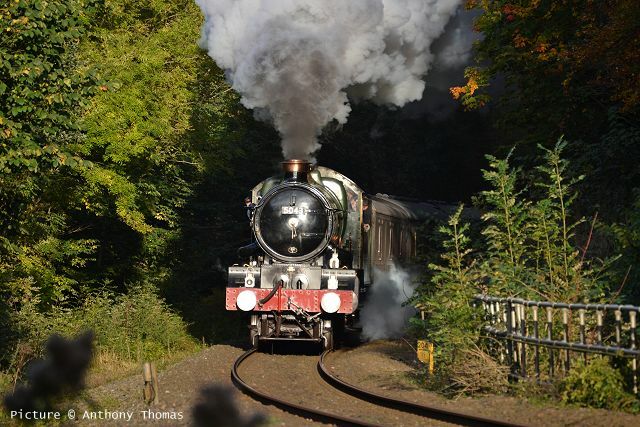 Tuesday 1 November North Wales Railway Circle North Wales Steam Days and Early Diesels. Change of speaker: Sixties Steam on Shed, with Barry Shore. A digital presentation based on Barry's monochrome negatives of the 1960s, obtained during his travels around various sheds and depots all over the Britain, concluding with the final days of steam on British Railways at Lostock Hall and the other last sheds. Wednesday 7 December RCTS Liverpool Paul Wright: The 8D Association. Paul is Editor of the Association’s Journal. 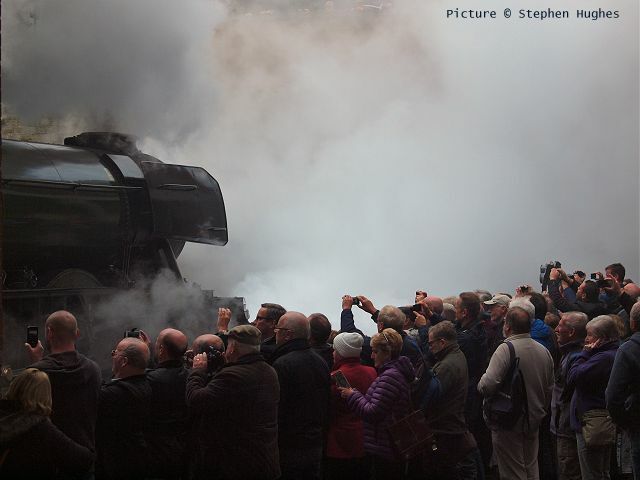 Monday 19 December RCTS Chester John Hobbs: North Wales in Black & White.John lives in Warrington and is well known for his presentations covering the final years of steam in North Wales and around the north west. 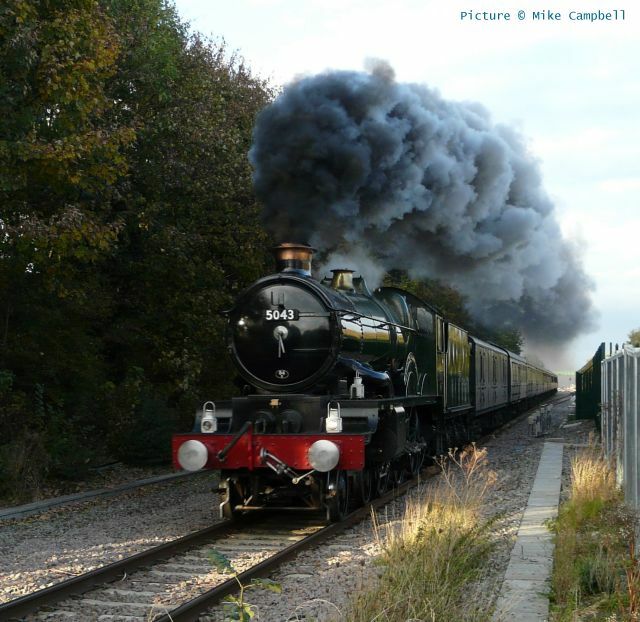 He is a member of the Branch and is actively involved in railway preservation. Tuesday 3 January North Wales Railway Circle Secretary’s Evening. 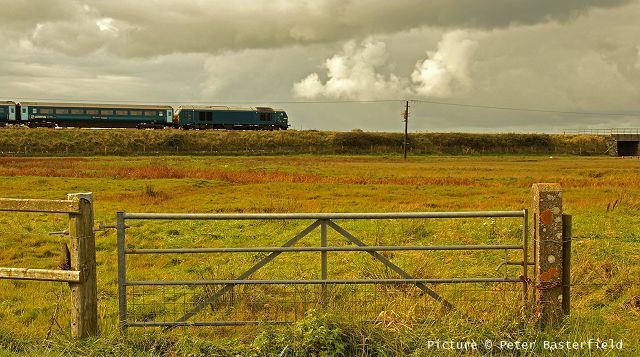 North Wales Railway Circle Secretary, Peter Hanahoe, presents a selection of his vast catalogue of photographs he has taken on the international railway scene. 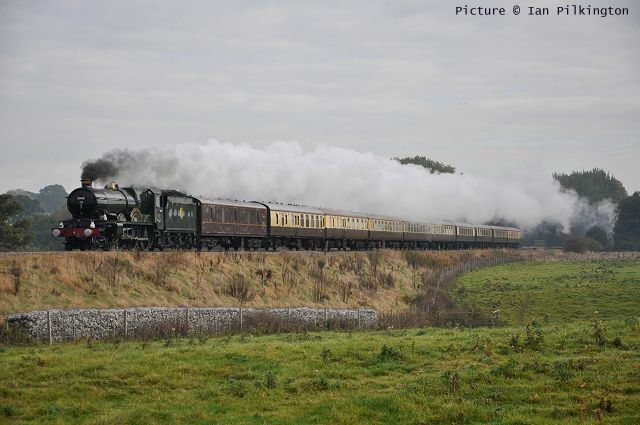 Wednesday 11 January Welsh Highland Railway North Wales Group Dr. Dafydd Gwyn - The First 80 Steam Locomotives. cover our Branch’s 2016 outdoor visits and other topical items. He is a long standing RCTS member and now President of the Branch. Wednesday 1 February RCTS Liverpool Mark Youdan. 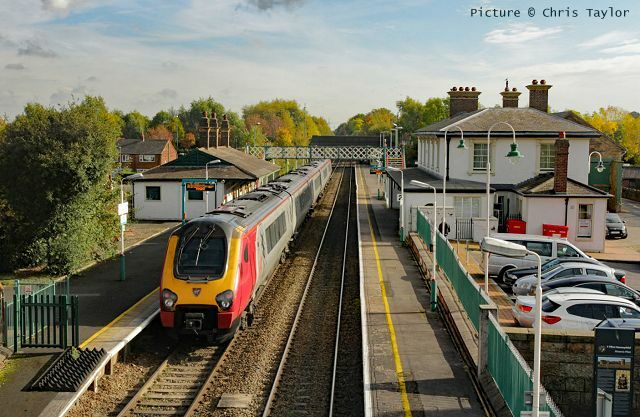 North West Railway Photography, 1995-2015. Mark, a Branch member, is a Driver/Trainer for Arriva Rail North and held the same position with Northern Trains. Friday 3 February Clwyd Railway Circle BR Steam - The Splendid Years (1959-65 in B&W) Steam around the regions in the early 60’s by John Sloane. 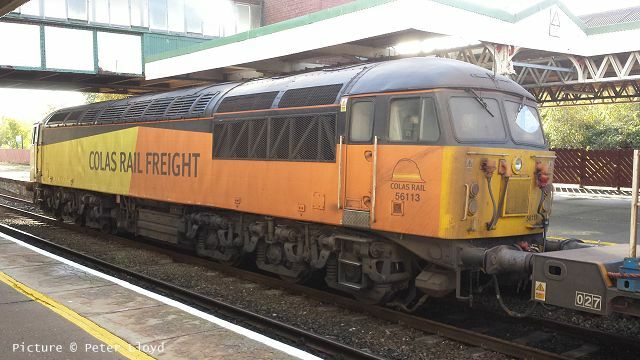 Tuesday 7 February North Wales Railway Circle Birkenhead to The Coast. 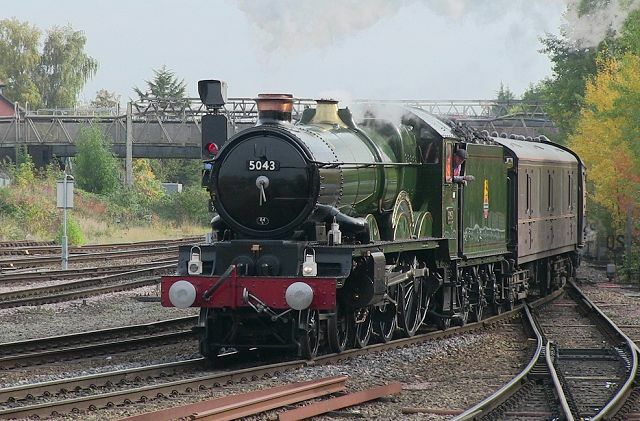 North Wales Railway Circle life member Ken Owen entertains us with a selection of pictures starting in Birkenhead, visiting his home town of Wrexham and traveling via his present home Redhill to Eastbourne and Margate on the South Coast. 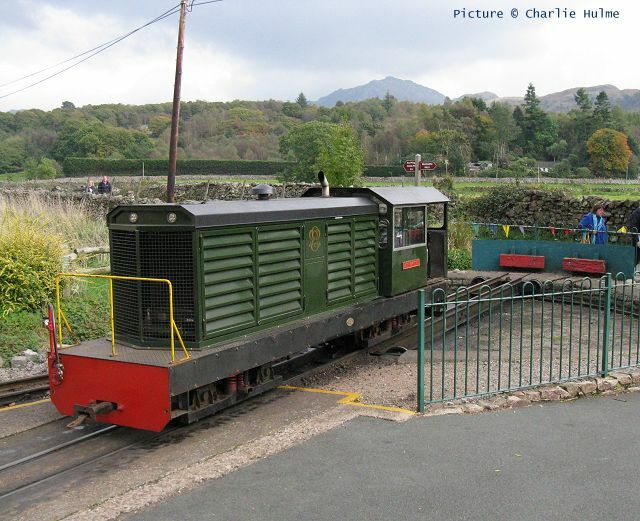 Wednesday 8 February Welsh Highland Railway North Wales Group Gareth Haulfryn Williams - The Vale of Rheidol Railway. 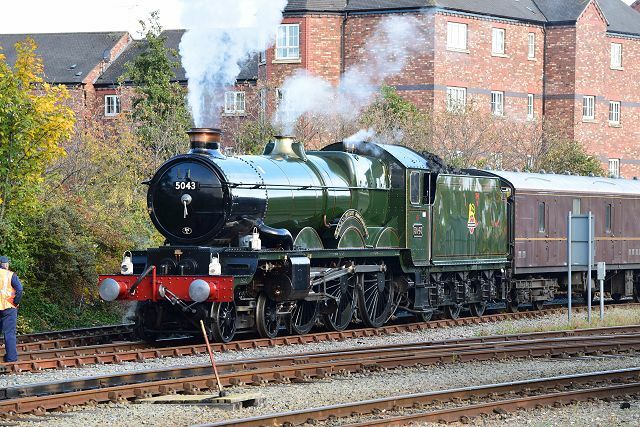 Monday 20 February RCTS Chester Fred Kirk: Leicester Area Steam Days. Fred, from Leicester, spent a lot of his time bicycling around with his camera at the ready to various locations on all the main lines within reasonable reach of his home. 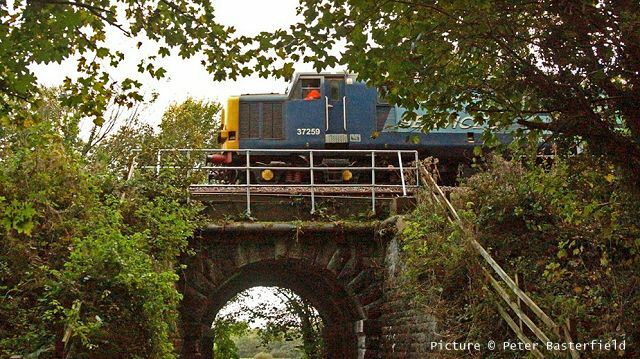 Friday 3 March Clwyd Railway Circle Amlwch Branch Line and Annual General Meeting Chairman of the Lein Amlwch - Central Anglesey Railway Company, Walter Glyn Davies will give a presentation on the progress of the lines revival. The talk will be followed by the Annual General Meeting. Tuesday 7 March North Wales Railway Circle The Abergele Accident. Tony Griffiths gives a talk on the accident that occurred on 20th August 1868 at Abergele involving the Irish Mail and a part of a goods train that was being shunted. Monday 20 March RCTS Chester Paul Chancellor. A Colour-Rail Presentation. 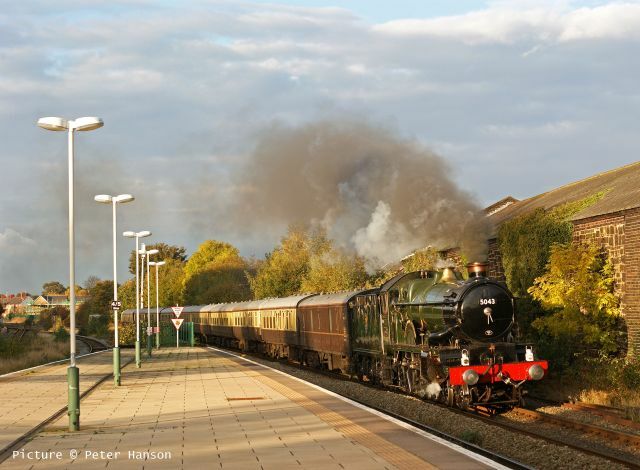 Paul, from Bromsgrove, is owner of Colour-Rail and will highlight the work of many fine railway photographers covering the better part of 70 years. He is also the RO Editor for the ‘Preservation and Other Railways’ section. 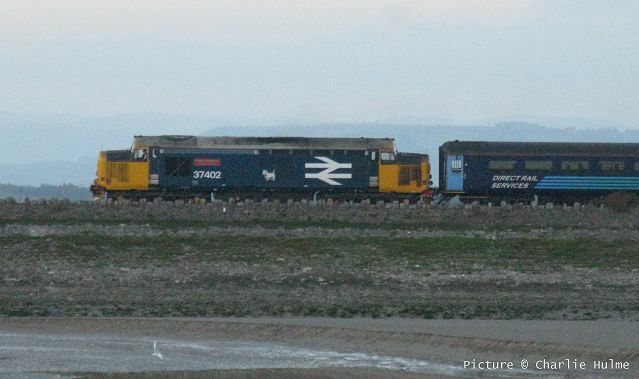 67 003 passes Rhosneigr, 19 October. Picture by Alan Crawshaw. 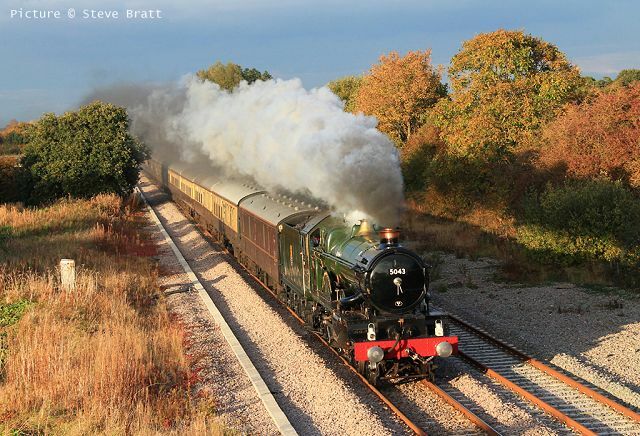 On 22 October, as the morning mist begins to fully clear, GWR Castle Class 4-6-0 5043 Earl of Mount Edgcumbe with the 1Z34 Tyseley Steam Trust to Chester excursion passes Chorlton near Crewe 'under the wires'. Picture by Robert Meredith. 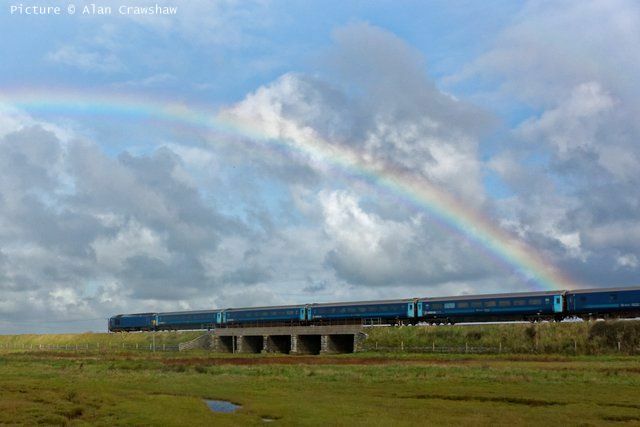 West of Beeston Castle between Crewe and Chester (Ian Pilkington). Arriving at Chester (Bob Greenhalgh). The parcels van carries a supplementary water supply. From the footbridge at Rossett on the return run just before sunset (Steve Bratt). The newly reinstated Up line still awaits commissioning, perhaps some time in 2017. Climbing Gresford Bank (Anthony Thomas). Oddly, the Rail Head Treatment Train does not cover this section of line. 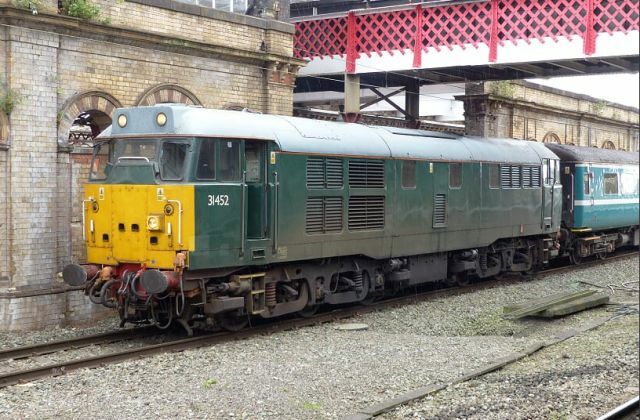 Martin Evans photographed Devon & Cornwall Railways loco 31 452 with a rake of three coaches at Crewe on 18 October. Does anyone know what movement this was? 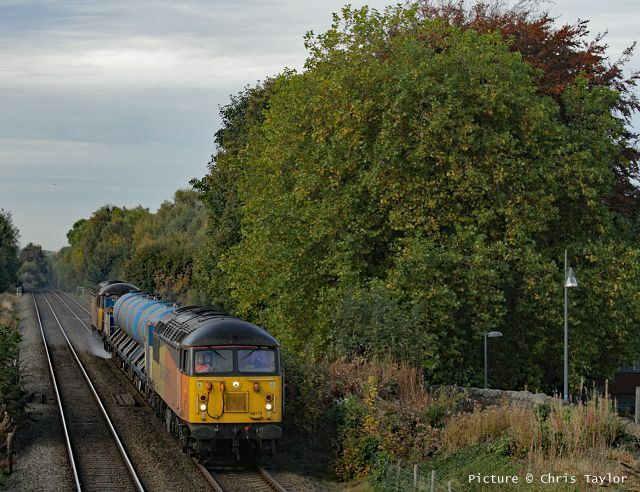 66 708 Jayne leads the Liverpool - Drax biomass train through Baguley on 20 October (Greg Mape). 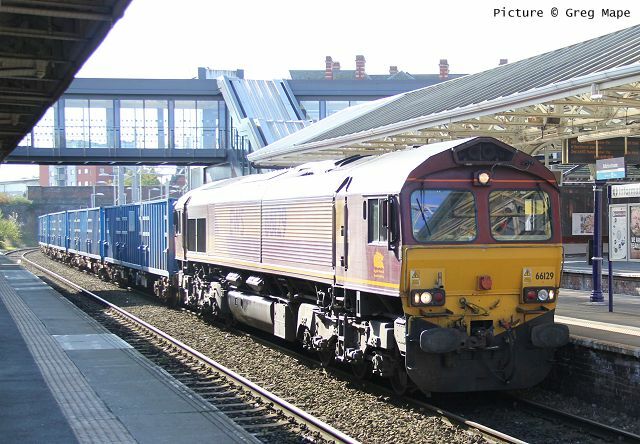 There has recently been a change in the working of these trains: the load train still travels via Altrincham, Stockport and Thorpes Bridge Junction to avoid the climb westbound out of Manchester Victoria, but the empties now travel a more direct route through Manchester Victoria. 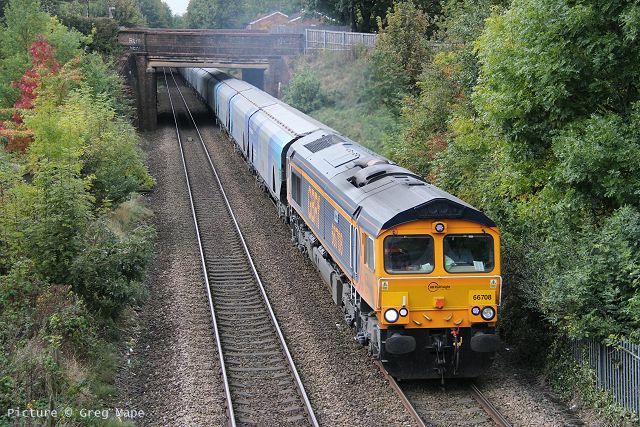 Altrincham on 11 October, with 66 129 on the Knowsley to Wilton refuse containers (Greg Mape). Travelling to a Sheffield model railway exhibition on 8 August, we chanced upon Porterbrook's 'Evolution Pacer' prototype refurbishment of a Class 144, 144 012, which the company hopes will enable them to have a longer life. It is in use with Northern at present, but there is little chance that Northern will order any as their Franchise agreement virtually forbids it. Will we see them in Wales, we wonder. 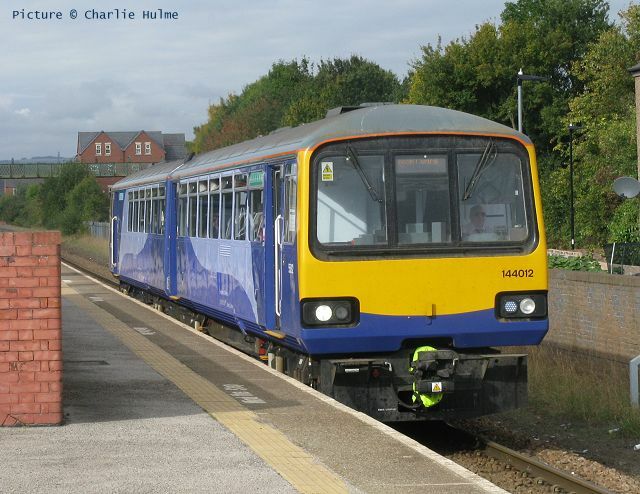 Picture at Darnall station by Charlie Hulme. 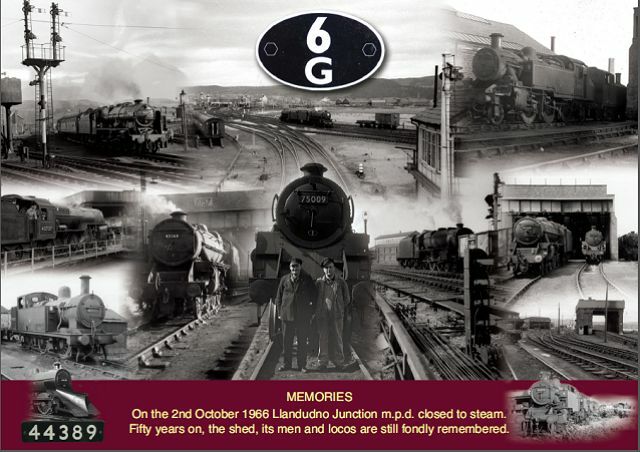 Both the commemorative events organised to mark 50 years after the closure of Llandudno Junction loco shed went off very well with a good number of the former loco shed staff and enginemen of the old shed meeting for coffee at the Queens Hotel, Llandudno last Tuesday morning. All those present were presented with a copy of the commemorative limited edition postcard (above) which I produced featuring photographs by Norman Kneale and myself. 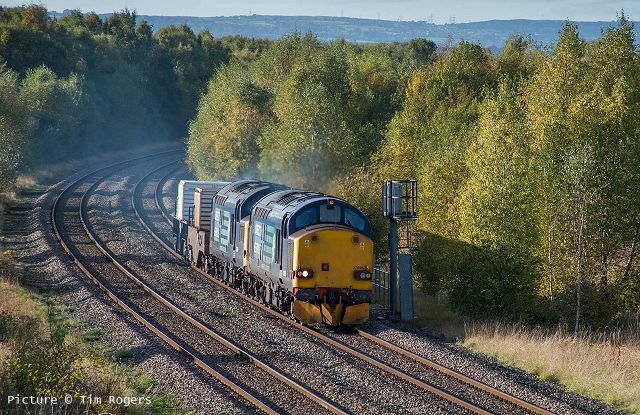 ... and so the world moves on, and I enclose a shot of today's modern power in 6G land as 68 003 Astute and not-so-young 37 602 head the flasks through at speed on Friday 14 October. As D6782. 37 602 was already almost four years old, and working on the Eastern Region when 6G shed closed. 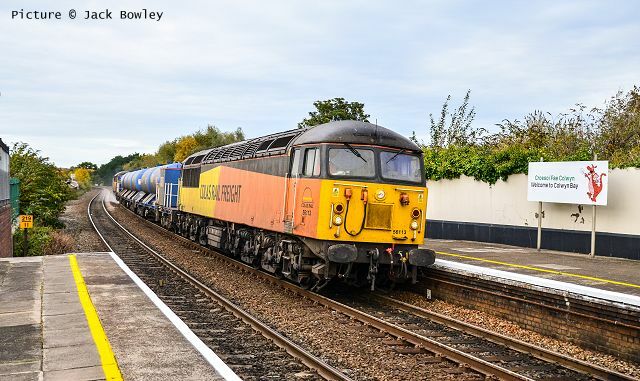 With his modeller's eye, Tim Rogers photographed the wagons of the Rail Head Treatment Train passing Bagillt on 16 October. Above, 642027. 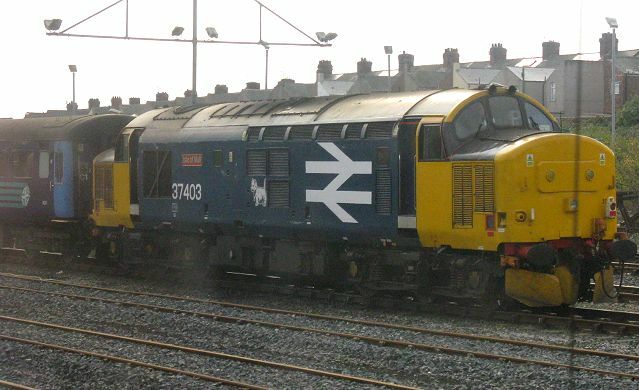 642045. 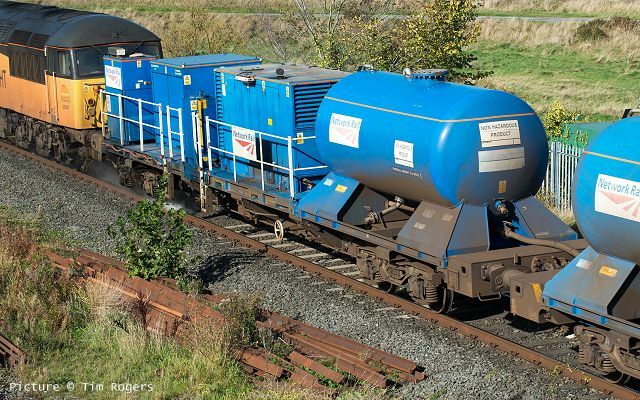 The train consists of a series of modules mounted as required on what are basically standard container-carrying wagons. 50 examples, 642001 to 642050, were built in 2005. 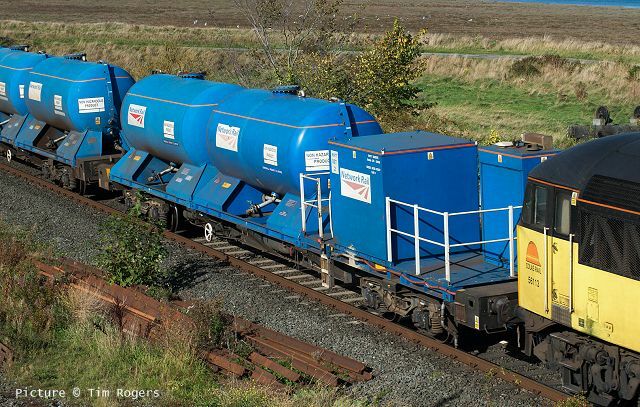 Unlike the many other FEAs in use on freight traffic, they are fitted with multiple-working cables to allow to--and-tail loco working, and spraying equipment on the underframe. 642016. Note the flexible water pipe linking the tanks. The wagons have no other use: they are stored for the rest of the year. Slightly scruffy 56 113 waiting in platform 4 at Llandudno Junction for a Holyhead service to pass. 18 October (Peter Lloyd). 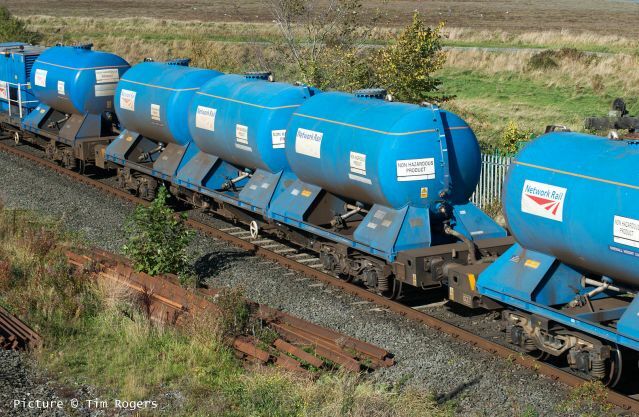 21 October's Rail Head Treatment Train leans to the curve at Colwyn Bay (Jack Bowley). 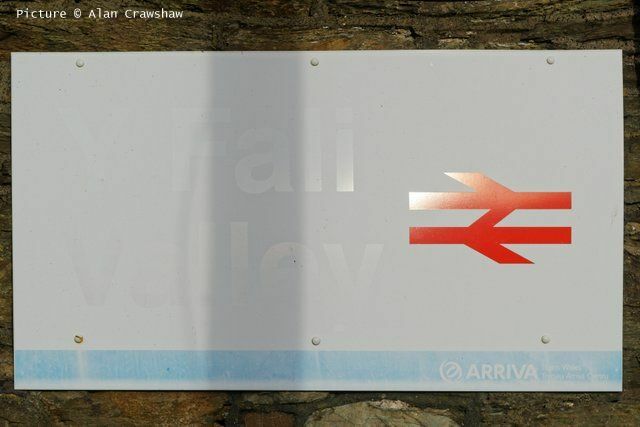 The 'Croeso' sign looks in good condition. The RHTT and some of the organisms that require its attention, near Fflint on 21 October (Chris Taylor). 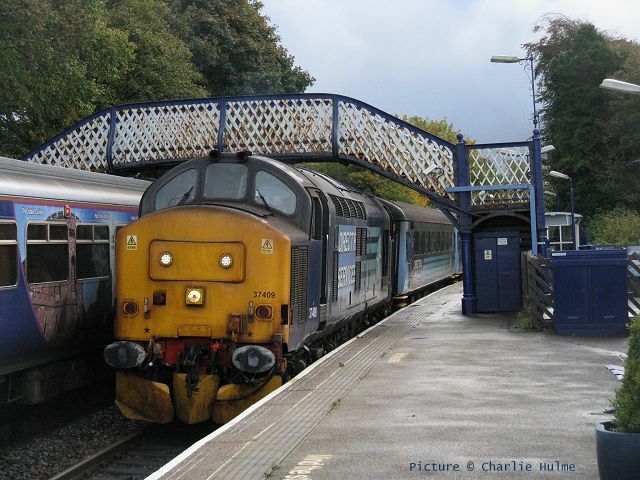 Late in the evening of 21 October, while starting its next run at 21:15, the train is reported to have derailed on a set of points at Coleham depot. The overnight part of the diagram was omitted while the problem was dealt with, finally departing soon after 08:00 and running to Holyhead and back. I've recently found this attached photograph. Something stirred a memory, I seem to recall that it might have been taken by a school friend of my father's who lived in Criccieth, which makes me think that it was taken on the Cambrian Coast in the early 1930's. There are no notes attached to it, but a quick look through a couple of books I have on the Cambrian make me think that it was taken at Talsarnau. A picture in Bill Rear's 'The Cambrian Coast Railway' taken in 1955 shows a later Camping Coach in a very similar position, and another shows an identical six wheel clerestory coach at Barmouth Junction (Morfa Mawddach). 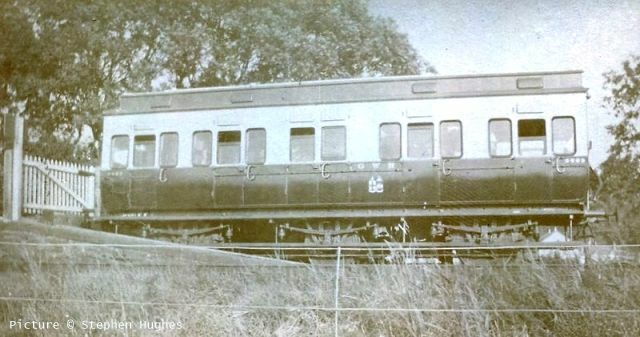 It is noted that the six wheelers were replaced by larger coaches at some point, but no date is given. Any information on the provenance of this coach would be of interest. 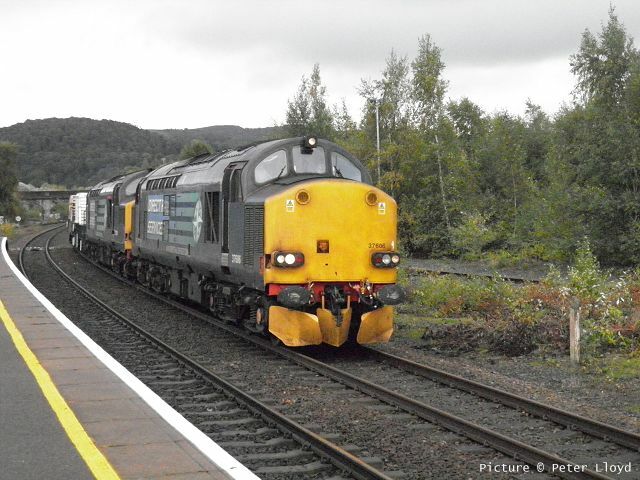 37 259 leading 37 606 on the Flask train at Talybont, Monday 17 October (Peter Basterfield). 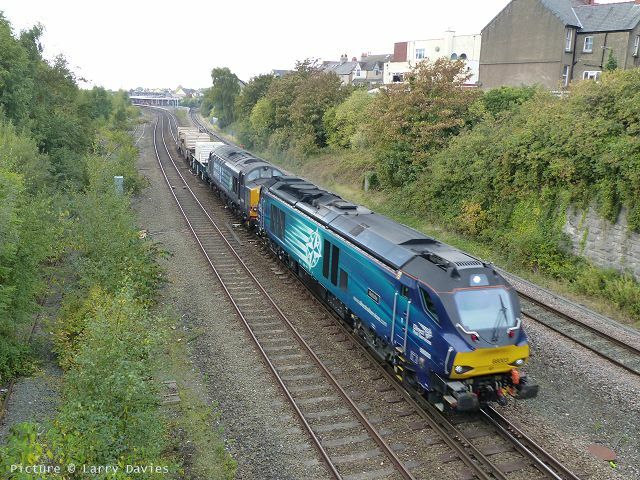 The westbound flask train for Valley, train 6D43, passing Llandudno Junction at 08:57 on 19 October with 37606 leading 37 259. 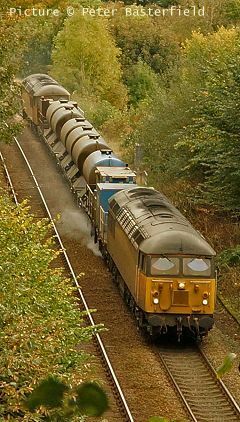 Return flasks on 19 October at Saltney (Tim Rogers). 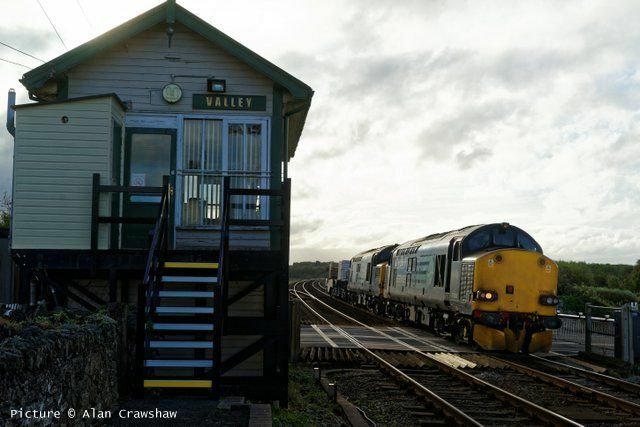 Arriving at Valley on 21 October (Alan Crawshaw). 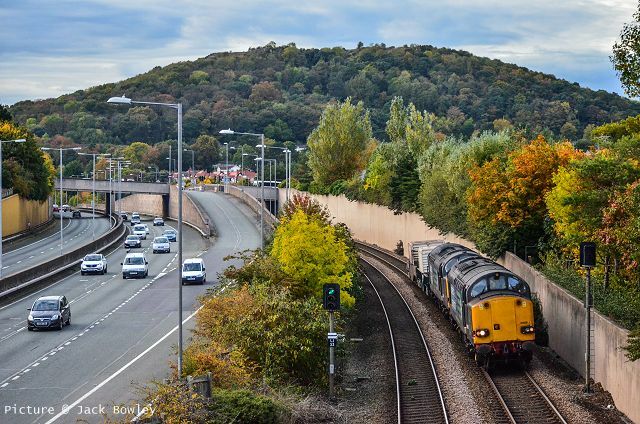 The eastbound flask train with 37 603 and 37 605 approaching Colwyn Bay on 21 October, on the section that was re-located in the 1980s to make room for the A55 road (Jack Bowley). 175 105 passes Bagillt on 17 October, working 1H88 12:53 Llandudno Junction to Manchester Airport (Tim Rogers). 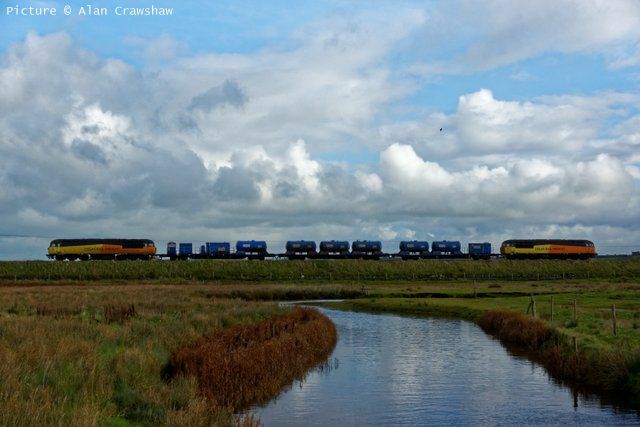 67 003 near Rhosneigr on 1D34 Manchester - Holyhead, 21 October (Peter Basterfield). 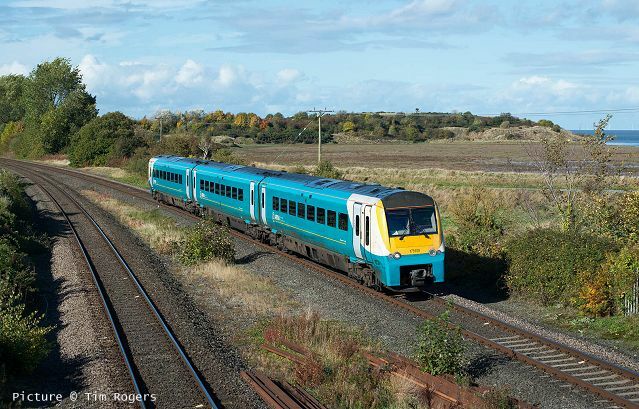 175 103 on the 12:32 Holyhead to Maesteg approaching Fflint on 21 October (Chris Taylor). 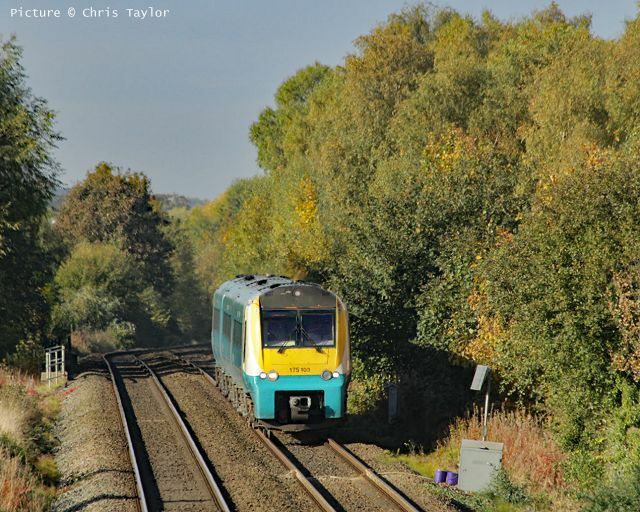 221 113 calling at Fflint whilst working the 12:52 Holyhead to London Euston on 21 October (Chris Taylor). 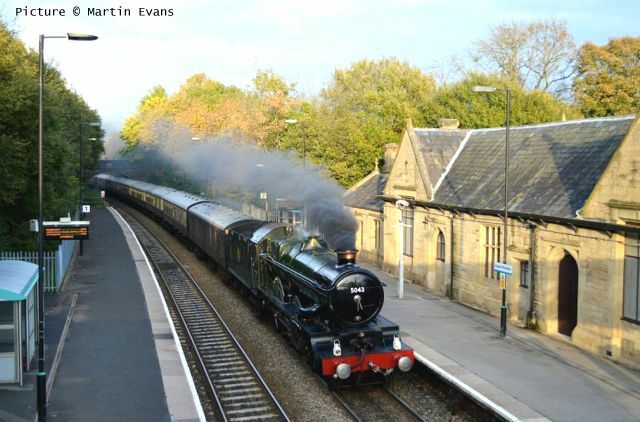 I headed to the East Lancs Railway on Thursday 13 October, as extra trains were running on a weekday because of the second visit of Flying Scotsman, which was scheduled to work four non-stop trains on the Bury-Rawtenstall section. Three were completely sold out with a few remaining unsold on the last departure of the day at 17:00. The cost of £25 was roughly double the usual price but didn't seem to deter the adoring public (above). 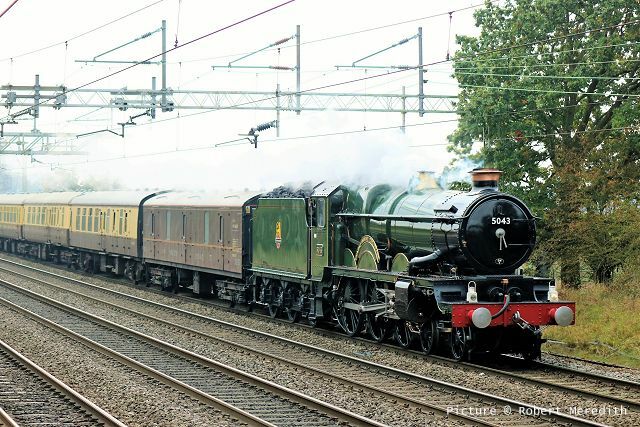 Hopefully 'Flying Scotsman' is proving to be a money spinner! The other two engines working the service trains were 'West Country' 'City of Wells' and the Aspinall 0-6-0 12322, incongruously carrying a 'Flying Scotsman' headboard. Returning to Llandudno Junction on the evening loco-hauled train, 16:50 Manchester Piccadilly - Llandudno behind 67 003, it was evident that the four coaches were necessary as there were standing passengers at various times between Piccadilly and Chester. Fewer passengers along the coast, but nevertheless a good non-stop run from Chester to Prestatyn, and a slightly early arrival at the Junction. Since I last travelled on this service station dwell times seem to have improved, are passengers now managing to close the door behind them? 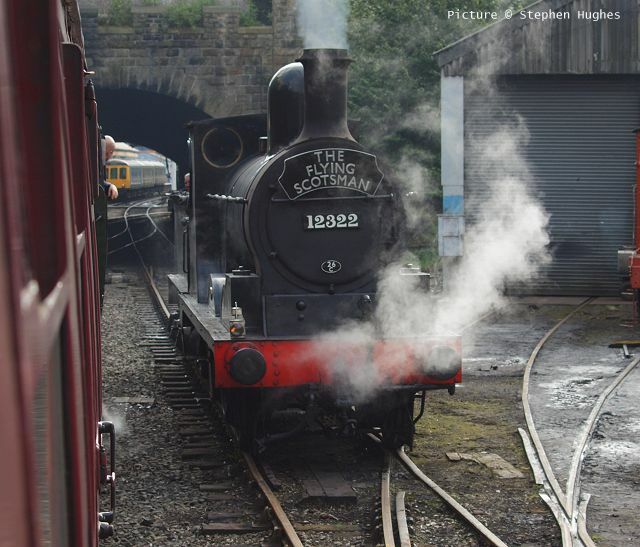 We visited the Brecon Mountain Railway on 11 October, and had a great day out. We were blessed with good weather. The loco that day, No.2 (above) was a Baldwin 4-6-2 built in 1930 - it is now back in service after a long rebuild. 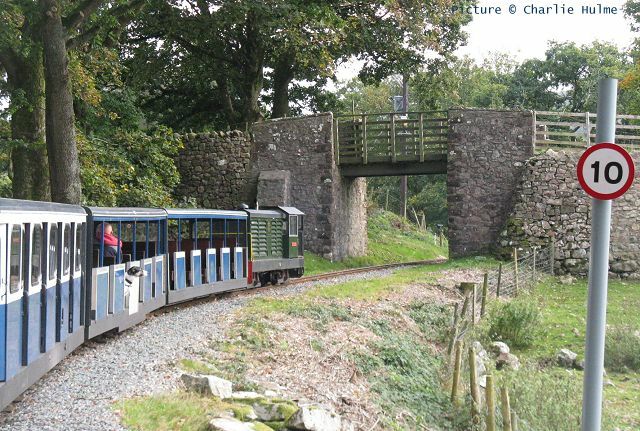 Following a trip up the 4½ mile line to Torpantau (which used to be one summit on the old Brecon and Merthyr Railway) the train returned to Pontsticill where passengers were given 35 minutes to look around and visit a café and a small 'Steam Museum'. 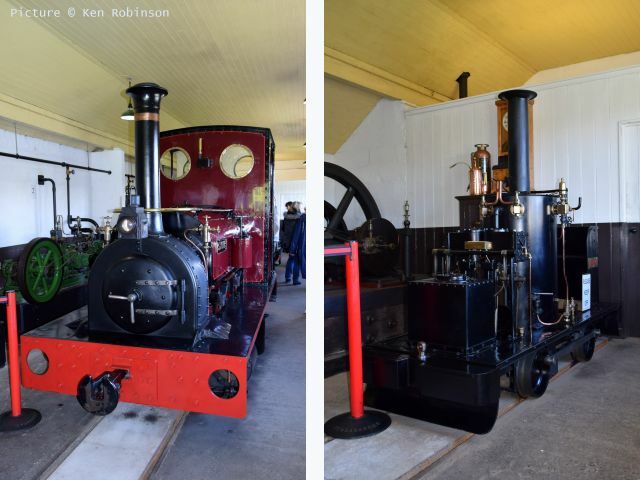 This contained locos with North Wales connections: Sybil (above left) a Hunslet 0-4-0 built in 1903 and sister to Una which is on the Llanberis Lake Railway Like Una, she was used at Pen-Yr-Orsedd Quarry at Nantlle, and was purchased in 1963 and rebuilt, hauling the first trains on the BMR in 1980. 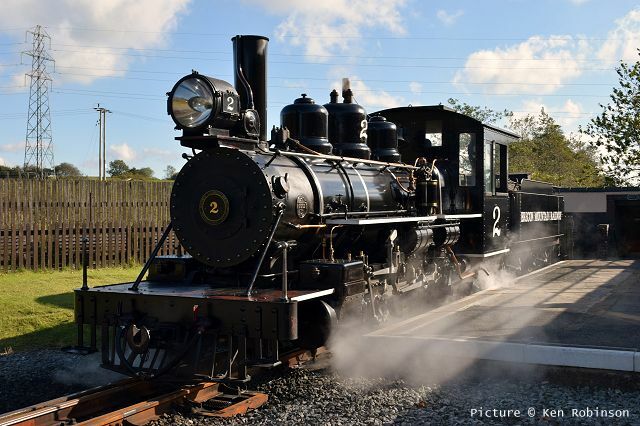 The loco was fully restored in 2012, but only appears these days at special events. The views from the train are quite spectacular, especially in fine weather. 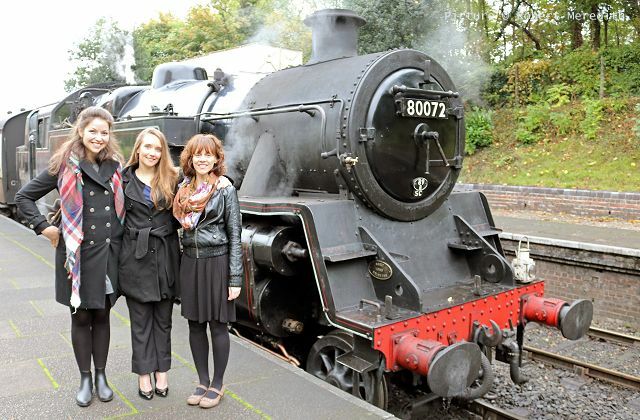 During the weekend of 8/9 October, a local film company from Cheshire - Ed Stephenson Productions - were film making at the Llangollen Railway.The five-minute film entitled 'Burning Grief', is based on three sisters handling the sad loss of their father in different ways, and carrying out his last wishes of interring his ashes into the firebox of a steam locomotive. The film will be shown on the International Film Festival Circuit, and is due for release in early 2017. 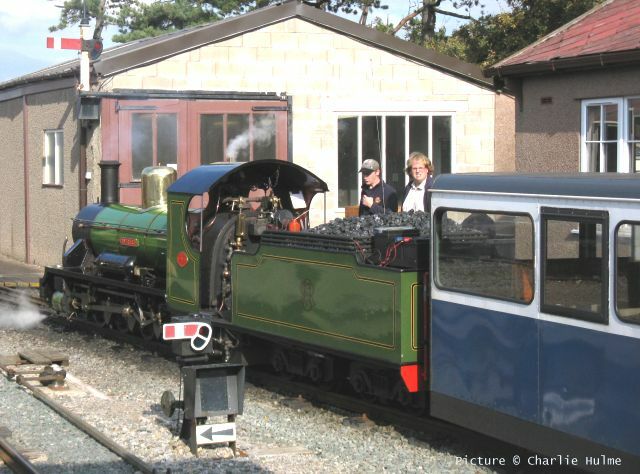 Above: the cast and film crew getting in position to film the 15:10 departure for Corwen on 8 October. The cast and crew were very appreciative of the assistance and co operation they received from all the staff and volunteers at Llangollen Railway over the weekend, in the making of the film. The three stars too the time to pose for us. 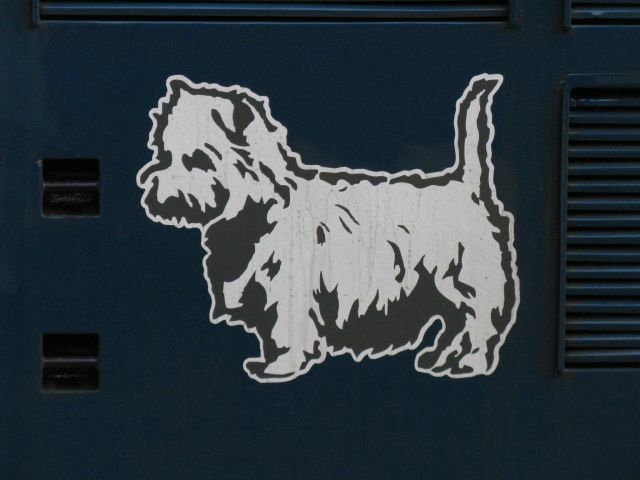 ... complete with 'Westie dog'. The consist was 5787, 6064, 5810 and driving trailer 9705. In the carriage sidings at Barrow was sister loco 37 403 Isle of Mull. From Ravenglass we enjoyed a ride in a 'literally' open coach to Dalegarth and back behind diesel loco Lady Wakefield. Through books are available from Northern Railway stations, and Northern's conductors are very keen to sell them. Coming off the turntable at Dalegarth. We were very impressed by the running of this line; although 15" gauge, it is no 'toy railway'. Also in traffic was steam loco River Irt, interesting in that it was rebuilt from one of Sir Arthur Heywood's pioneer 15" gauge locos, dating from 1894. Arnside with its estuary bridge offers some fine view of the trains, although there is only one out-and-back locomotive working per day on the Preston - Barrow section. We should have seen a steam-hauled 'Cumbrian Coast Express' on the afternoon of 15 October, and some locals had gathered on Arnside pier to watch, but in true West Coast Railways style this had suffered a change of route at short notice and returned via Shap because loco 45690, which has replaced un-available 46115, could not run this way due to 'gauging issues.' Is a 'Jubilee' bigger than a 'Scot' ? 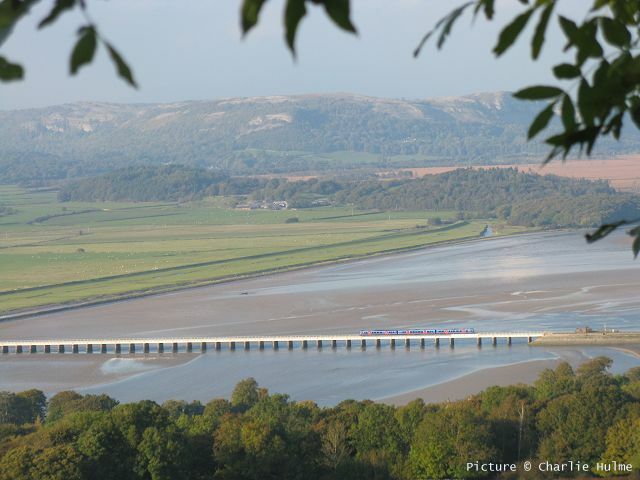 The bridge, seen from Arnside Knott at 500 feet. 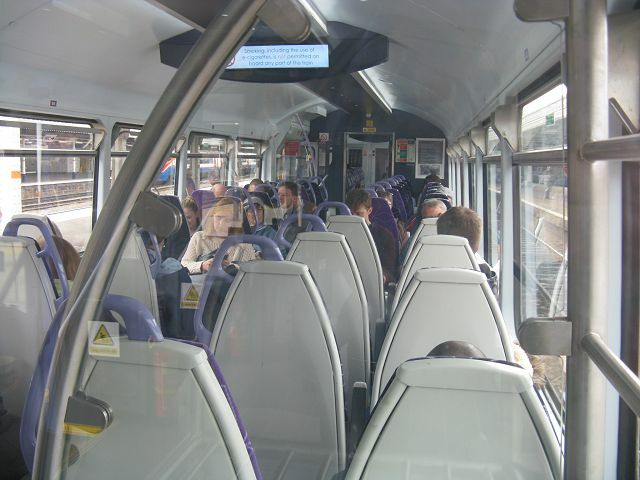 The Class 185 crossing is on a Northern service although the train is a TransPennine one. 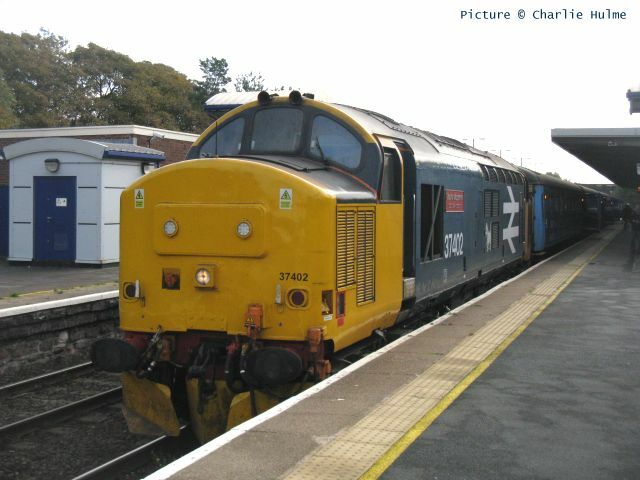 This oddity is the result of the recent franchise changes, bringing First Class travel options to the Northern network. The bridge deck was completely renewed in 2011. 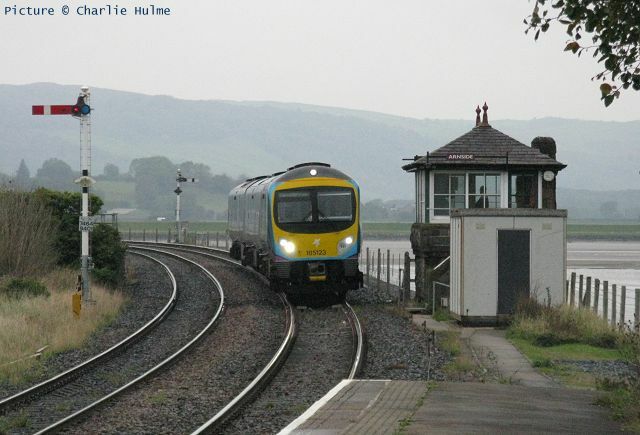 Semaphore signalling is a pleasant feature of the Cumbrian system; 185 123 - in the new TransPennine livery - comes off the bridge on 16 October and passes Arnside's Furness Railway signalbox. On 17 October - the 60th anniversary of the official opening by Queen Elizabeth II on 17 October 1956 of the World's first nuclear power station, Calder Hall - slightly unkempt 37 409 Lord Hinton was in charge of the 10:04 Preston - Barrow train, seen at Arnside passing a Northern 156.